Vincent Versace is a world-renowned photographer whose work is part of the permanent collection of the Smithsonian Institution's Museum of American History. He has led photographic workshops to San Francisco, Burma, Viet Nam, India, Morocco, Costa Rica, Santa Fe, Egypt, Cambodia, Mongolia and Australia, and is a recipient of the Computerworld Smithsonian Award in Media Arts & Entertainment and the Shellenberg fine art award. He teaches regularly at Photoshopworld and is a regular instructor at the Maine Photographic Workshops, Santa Fe Photographic and Palm Beach Photographic Workshops. Additionally, he consults for many of the top brands of photographic equipment and supplies, including Nikon, and is considered a leading authority on digital imaging. When Vincent needed to revamp the print portfolios he uses at the workshops and lectures he gives around the world, he came to us in search of solutions. 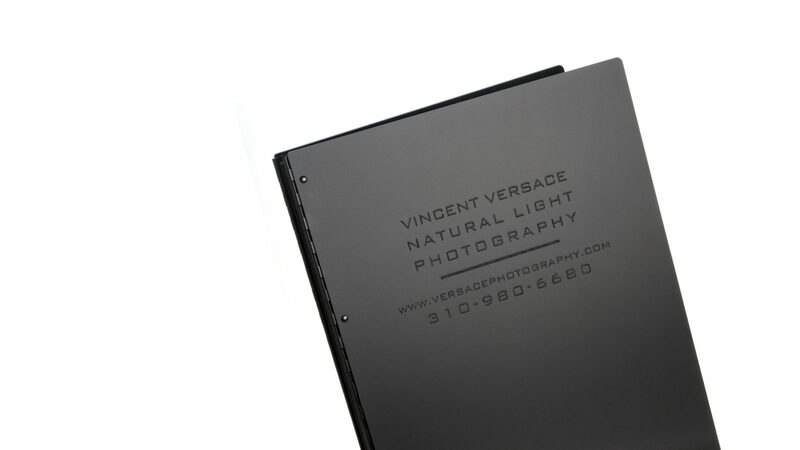 After carefully examining how he shows his work and to whom, we proposed a suite of Versace-branded books and boxes, including Machina Presentation Boxes and Machina and Vista (Onyx) Screwpost Binders Books, all in 13x19 format. The materials he chose were strong enough to withstand the rigors of international travel, while the addition of Vincent’s logo to the exterior of the boxes and books gave them a distinctive look.